A tropical disturbance has strengthened overnight and is likely now a tropical depression. We will be able to tell more with the first visible satellite images. A large burst of deep convection is associated with the low. Impacts to the resorts should be minimal since the low is already well offshore. As of 8:00 am edt / 5:00 am pdt the tropical disturbance was centered near 17.5°N / 108.2 °W or roughly about 260 miles west southwest of Manzanillo, Mexico. Movement is to the west northwest at about 10 mph. Top sustatined winds are estimated at 30 mph. Forecast models take this system away from the western coast of Mexico and south of Cabo San Lucas. 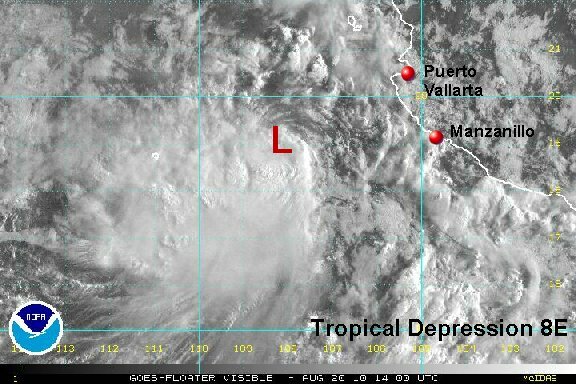 As expected the hurricane center classifed the new tropical disturbance west of Mexico. Don't look for much strengthening as it moves south of Cabo San Lucas over the next couple of days. 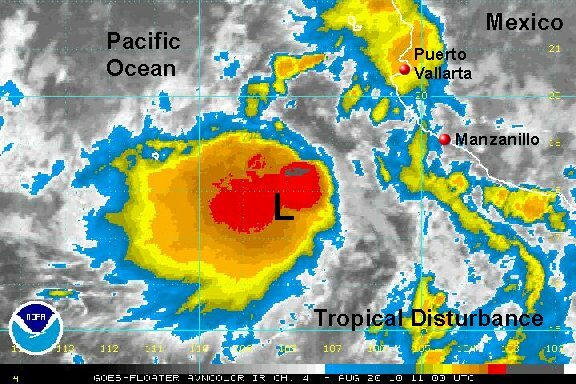 As of 11:00 am edt / 8:00 am pdt tropical depression 8E was centered near 19.1°N / 107.9 °W or roughly about 295 miles south southeast of Cabo San Lucas, Mexico. Movement is to the northwest at about 7 mph. Top sustatined winds are estimated at 35 mph. Pressure estimated at 1004 mb. Visible satellite imagery shows that tropical depression 8E has lost the majority of its convection. It poses not threat to land. This will be the last update on 8E.